I remember when I was about 3 or 4, most Sundays my parents would round up our family of 5 into the Rambler and we would tool around the Louisiana countryside. I don't remember where we visited or what we did, but eventually we would get ice cream or some other treat so I never minded the afternoon trips. With gas prices in Boone about $1.90/gallon for regular grade, Sunday drives are basically out of the question. This morning, I had a purpose to be driving around the countryside. I picked up my eldested from a sleepover which was in the Northwest section of the county...literally spitting distance from the Tennessee border in a community called Zionville. I wandered from Valle Crucis over to the Mast Gap. I cut through Sugar Grove and the Cove Creek community. Sherwood was packed with people filling it's churches. The morning was gorgeous and temps in the high 60's. I soaked in the scenery and promised to come back when I had time to stop and take photos. 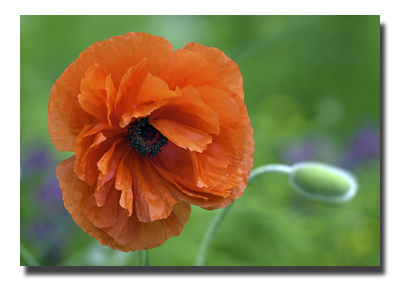 I did manage to take a photo of this poppy. The color is so vivid and plays nicely with the spring greens everywhere.